Unmatched in their softness and consistency, Schmincke soft pastels were created using the finest artist's pigments and a minimum of binders. 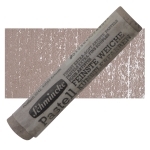 Pastel softness permits beautiful dense application, and high pigment concentration results in intense colors. Zinc Iron Chromite Brown is a dark reddish brown pigment that is opaque and staining. Zinc Iron Chromite Brown is exceptionally lightfast, heat resistant, weather resistant, and durable. Zinc Iron Chromite Brown has not been identified as hazardous, but it is likely to contain impurities that are irritating to the skin or lungs. Pigment from natural ores may contain traces of heavy metals. Because of its exceptional durability and heat resistance, Zinc Iron Chromite is used as a brown pigment in ceramics. ® Schmincke is a registered trademark.